Extreme views on what is "extremism"
Were it not for YouTube, perhaps Christopher Stevens, the U.S. ambassador to Libya, would still be alive. He was of course referring to this video by Sam Bacile in which the prophet Muhammad is insulted. He then goes on to say that, "extremism begets extremism." Indeed, there is clear evidence that Sam Bacile, Terry Jones, Osama Bin Laden, Charles Manson, and other extremists understand this implicitly and commit their extremist acts with the idea of inciting a wider war. The implicit assumption here is that making and posting a film intended to insult a religious group is an act of "extremism" and that this is somehow in the same class of actions as violently mobbing an embassy or carrying out acts of terror. Note that Terry Jones is classed as one of these "extremists". His terrifying act of extremism was to burn a book deemed sacred by certain people. Offensive as this might be to Muslims, I hardly think this is in any way comparable to the actions of people like Charles Manson or Osama bin Laden who were responsible for the actual killing of human beings. Posting an offensive video is not an act of "violence" in any sensible use of the word, and certainly not a form of killing as no-one actually died in the making of the film as far as I know. I have only watched part of the video, but to the best of my knowledge it does not advocate that anyone be killed. So how is it a form of extremism? Ravi Iyer argues that incivility is provocative and regularly leads to violence. Sure, I would agree that violence often is preceded by provocation of some sort, such as deliberately insulting words. But does this mean that the video is to blame for the actions of people who chose to go into the streets with torches with the intention of burning a building while people were inside? Where is the responsibility here? If a man comes up to me and says, "You're mother is a whore!" am I not responsible for how I choose to react? Even if the man is deliberately trying to incite me to fight, I would still be held legally responsible in a court of law if I chose to react with violence. As a human being I have a choice about how I react to provocation. In such a situation I have many choices, such as telling the man he is a stupid idiot and walking away. Violence does not simply follow on from provocation in the way that night follows day. There is a choice involved. Iyer cites a number of research studies on how people typically react to various kinds of threats to show that group reactions to incivility are fairly predictable. I think he does make a point that incivility is not the best way to deal with inter-group tensions. However, there has also been research finding that when people choose to react with violence to provocation, it is because they believe that violence is an acceptable, or even expected, response. For example, if someone is raised in a "culture of honor" they may believe that failure to respond to a provocation with aggression will be seen as a sign of being weak. Similarly, if someone believes that an insult to their religion or holy book is equivalent to a shocking crime that must be avenged, violence is the predictable result. 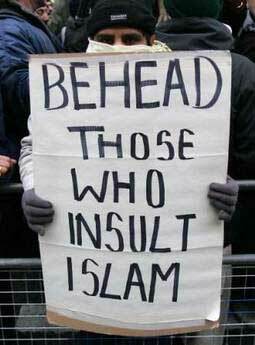 This image is authentic: sign held by a Muslim protester in London. Image source. Consider what the world might be like if people generally believed that violence was never an acceptable response to a mere insult. Would not the world be a more peaceful place? Is this too much to ask for? Ahmed Shihab-Eldin argued that it is intolerance, not Islam, that is the real cancer. But does tolerance mean that critics of religion must shut up so that some people will not be offended? What happened to tolerance of differing opinions? Any religion, or interpretation of religion if you prefer, that preaches that violence is an acceptable response to non-violent provocation is preaching intolerance. People have the right to be upset when they feel insulted. No-one has the right to go out and kill people and spread terror just because they are upset. Incivility may be unwise, but it is hardly morally equivalent to extremism. Blaming rudeness for resulting acts of violence seems like an abrogation of moral responsibility on the part of those who choose to engage in violent acts. It is time for people to realise that not being offended is a preference and not a human right. Being offended is never an excuse for violence. Ever. Yes, being offended is not an excuse for violence, but who doesn't know the likely results of insulting Islam. What is the purpose of burning a Koran if not to insult? The makers of the Muhammad Movie trailer paid to have the trailer dubbed into Arabic. Why? To make sure the people they were insulting got their "message". They knew what the likely reaction would be in the Islamic world. They were hoping for such reactions. They deliberately provoked violence and should be held accountable for that. It is quite mild compared with what it points out of known historical facts concerning Mohamed and the atrocities committed to innocent victims by muslims and in the name of islam. I was a bit disappointed, I expected some better parody, something more hilarious. Not the video is a provocation, but the suffering of the victims is a provocation, which makes such a video a logical presentation. It is insane to be provoked to violence by such a video, it is insane to defend such a religion in spite of all the atrocities. Muslims themselves are too insane to honor them by targeting them by provocation, but there should be not self-censoring when presenting any view on any weird religion.